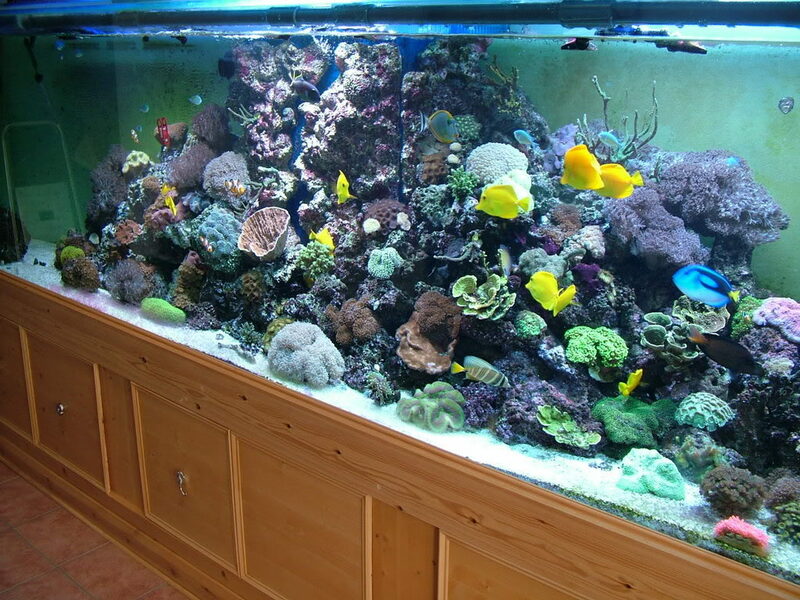 Choosing the right sized fish tank can be a daunting task. You may not know what dimensions are right for the fish that you want to keep and how big they will grow to be. Therefore, before you choose the fish tank, you need to do some research on the type of fish you expect to keep. If you know you are going to store a large sized fish; then it is advisable to get a large 500 litre fish tank and find the correct setup. As expected, larger fish tanks are preferable to smaller aquariums as they help the fish thrive better in the environment. In addition, greater water volumes help dilute toxins better and provide for better air circulation. Larger fish tanks cycle faster, which makes it less stressful for the fish. Here are some tips on picking up a large fish tank. Larger fish tanks are not easy to come by at a cheap prize. As such, you need to find the correct sources for the purchase. For instance, you can try to find someone who is looking to discard a used one. You can check on eBay, craigslist, local classifieds, or community websites that are dedicated to fish pet care. You may need to be patient and may have to pick up the fish tank from the owner, as having it delivered may be costly. 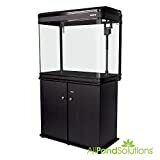 Dimensions: 1529(L) x 600(W) x 730mm / 60" x 23.7" x 29"
Cabinet Dimensions: 1529 x 600 x 705 mm / 60" x 23.7" x 27.7"
A large fish tank may be sufficient; however, for fish to survive, you need to give them a better environment. This includes a water filter, lighting, a hood, water heater, as well as a stand to keep the tank. If you do not have a stand that can withstand the weight of the large fish tank, you can begin by putting it on the floor. However, it is important to consider if the floor can withstand the weight. A professional will manage to find out by figuring the weight your flooring can manage by using pounds per square foot (PSF). You will need pictures of the large aquarium before the purchase. Ensure you get photos with good lighting, as this will help you identify any damages. For instance, a large fish tank that has a crack towards the bottom will crack in no time due to the water pressure. When buying a large 500 litre fish tank, both glass and acrylic are okay. Acrylic tends to scratch easier; however, it is less likely to develop any leaks. Consider the amount of water that is in a large fish tank, an acrylic fish tank would be best, as you are less likely to experience leaks. In addition, you will not have to worry about maintenance from leaks you are likely to experience from large aquariums. A large tank requires less in maintenance as the size allows for more circulation of oxygen and carbon monoxide. In addition, toxins are also rid off easily. However, it is always good to be prepared in case you rear many fish in the large tank. Using this buying guide, you will get a quality large fish tank. The fresh water Bala shark (balantiocheilus melanopterus) or silver shark needs a fresh water tank of large capacity. A 500 litre fish tank is sufficient, the average one being 5ft (L) x 1.8ft (W) x 2ft (H) equalling 102 square feet. Growing up to just over a foot in length the Bala shark will be more than fine in this size tank, but for the sharks best health it would be advisable to keep it alone or as a pair. The temperament of the Bala shark can be semi aggressive but when kept alone or as a pair is usually of no issue. They require moderate care in temperatures of 72 – 79 degrees Fahrenheit. Farm raised (usually) in Thailand they are a fish that is very visible through the day with its metallic silver body and yellow and black caudal and dorsal fins. They are omnivores and should be fed on flake food, frozen bloodworm, tubifex and other vegetable based foods. Bala sharks like an environment that is filled with driftwood, rocks and dense vegetation. Ensure they have a place to hide and a place to swim freely. When it comes to picking driftwood and rocks natural is best. There are various types of each available. These incredible sharks are usually bought quite small either in a ¾ to 1 ¼ inch range or 1 ¼ – 2 inch range. They will look pretty lost in a tank the size of a 500 litre but plenty of space will encourage their growth. Taking on the challenge of keeping a 500 litre fish tank stocked, clean and looking good is no easy feat, you will need to have experience in maintaining and monitoring your water levels, fishes health and also keep an eye on each individual fishes life. It takes time and money but can be extremely rewarding to have.